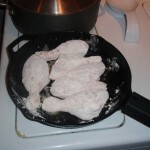 Combine flour, salt and poultry seasoning in a resealable bag. Add the chicken to the bag and shake to coat completely. Heat a large iron skillet or saute pan over medium-high heat and add the oil. 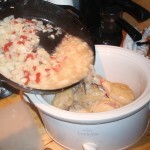 Add the chicken and cook for 5 minutes a side or until browned; remove chicken and place in the slow cooker. 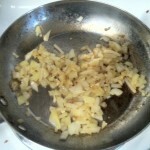 Add the onion to the skillet and saute - stirring frequently - until translucent. Add the garlic and saute until lightly browned. 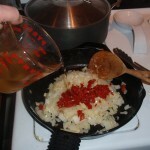 Add the wine and sun-dried tomatoes to the skillet and be sure to scrape the remaining bits from the chicken. 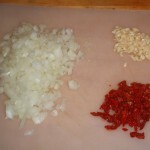 Pour the mixture over the chicken in the slow cooker and add pinch of crushed red pepper and crushed red pepper. Tie the sage and the rosemary sprigs with a bit of twine or in some cheese cloth and submerge in the broth in the slow-cooker. 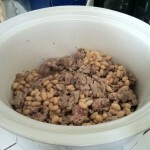 Turn the slow cooker on low and cook for 4 hours - 8 Hours (at 6-8 hours the meat will fall off the bone). 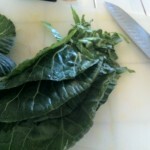 Remove sage and rosemary just before serving.